, a new tab in your control panel, you can now invite collaborators to become shared administrators. Admin accounts have capabilities similar to those of the owner, but they cannot access the Make Money (advertising) tab or create additional admin accounts. In line with these enhancements, we will be removing the Collaboration tab in a month. In the mean time, as an owner of a custom search engine, you can easily migrate existing sites from the Collaboration tab to your search engine definition and, if you like, upgrade existing collaborators to Admin accounts to give them shared administrator privileges. When we remove the Collaboration tab we will automatically migrate all sites but will not automatically upgrade all collaborators to admin accounts - so if you do want to keep existing collaborators on your site we recommend you migrate them today, or you can add them back manually later. We hope you’ll find these shared admin capabilities more powerful. Let us know what you think in our discussion forum. Posted by: Rui Jiang and Abhishek Rajgarhia, Software Engineers. Until now, CSE has had a simple collaboration feature that lets the owner of a custom search engine invite friends or colleagues to contribute sites, and assign labels to these sites. This was useful in expanding the scope of a search engine, but beyond expanding indexing, it limited what collaborators were able to do. Starting today, we’re replacing the current collaboration options with more powerful shared administration features. Through Admin accounts, a new tab in your control panel, you can now invite collaborators to become shared administrators. 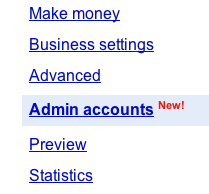 Admin accounts have capabilities similar to those of the owner, but they cannot access the Make Money (advertising) tab or create additional admin accounts.